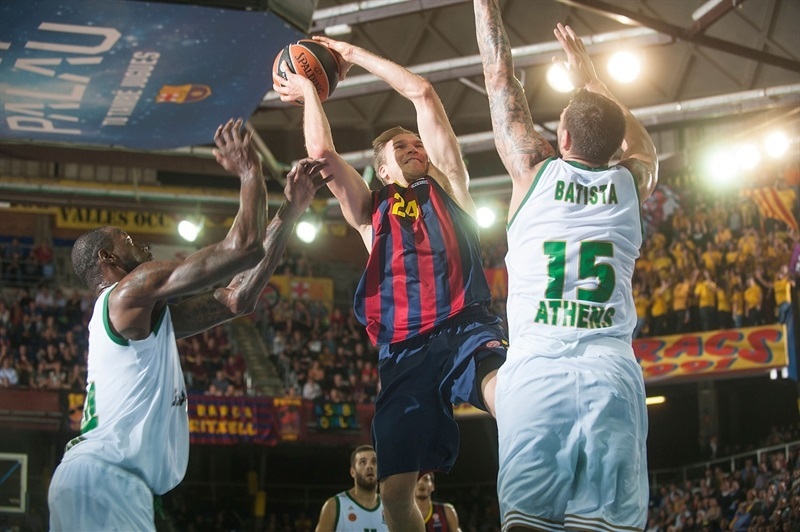 In an intense, physical showdown, FC Barcelona remained undefeated in Group C by beating Panathinaikos Athens 78-69 at home on Friday. 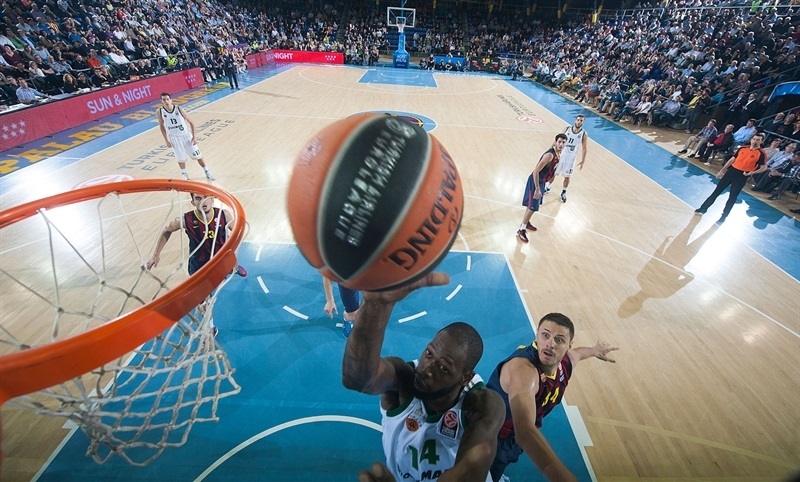 Barcelona improved to 5-0 in Group C while Panathinaikos dropped to 3-2. 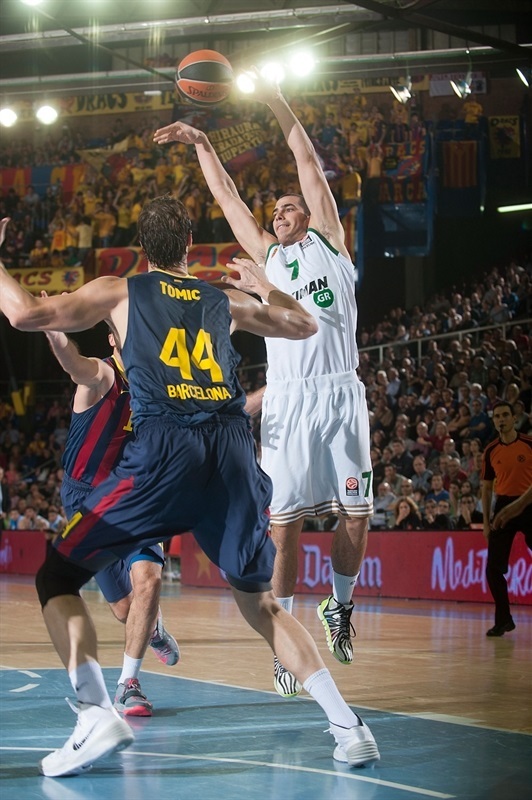 Ante Tomic paced the winners with 16 points on 8-of-8 two-point shooting and 10 rebounds. 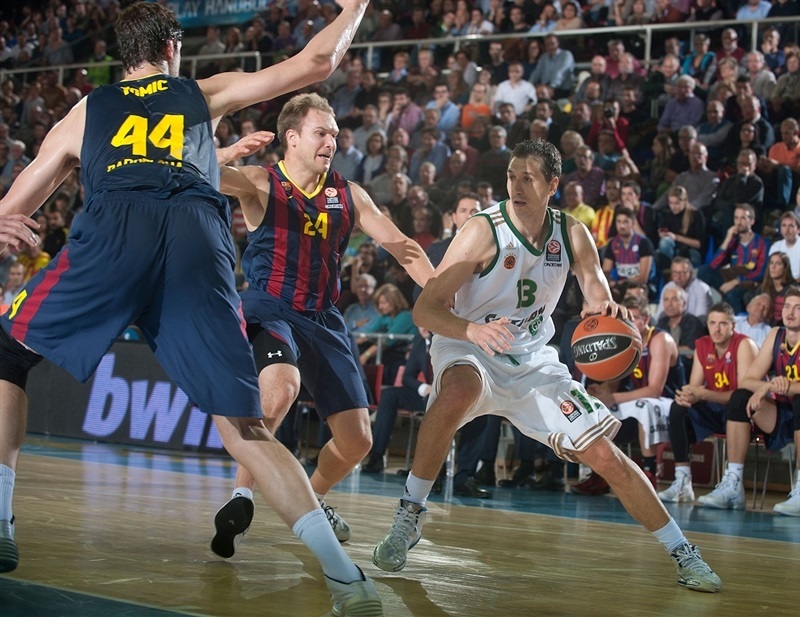 Juan Carlos Navarro, Brad Oleson and Maciej Lampe each added 12 points for Barcelona. 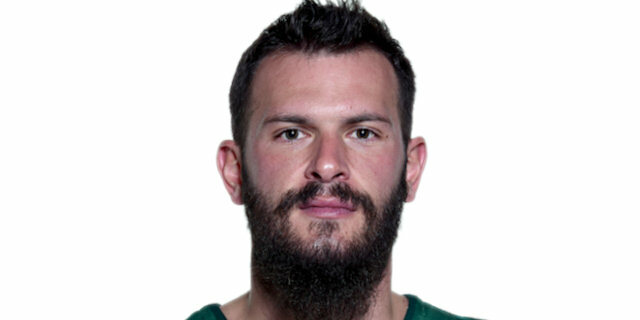 Esteban Batista led Panathinaikos with 14 points and 8 rebounds. Tomic had 10 first-quarter points, but Batista and Dimitris Diamantidis allowed Panathinaikos to stay tied at 18-18 after 10 minutes. An outstanding James Gist kept Panathinaikos as close as 34-33 but Justin Doellman had the opening 7 points in a 9-0 run that put Barcelona ahead, 47-38, at halftime. Back-to-back three-pointers by Marcelinho Huertas boosted the hosts' lead to 55-42. 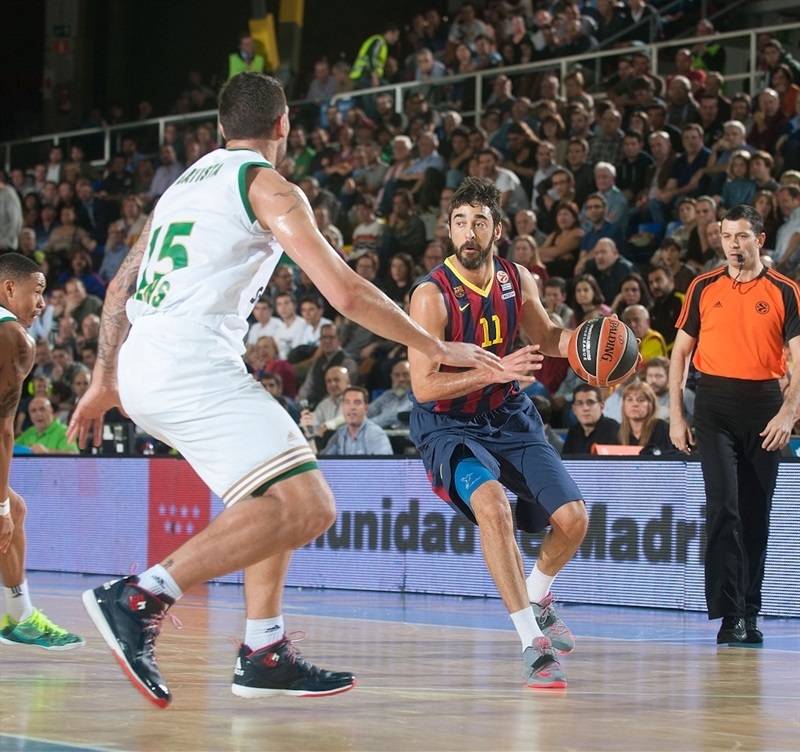 Panathinaikos got within 64-56 at the end of the third quarter and then within 67-62 with six minutes left but Navarro and Tomic stepped up in crunch time to lead Barcelona to another win. First quarter: The Tomic vs. Batista show! DeShaun Thomas got Barcelona going with a turnaround jumper, which Dimitris Diamantidis erased with a quick basket in transition. 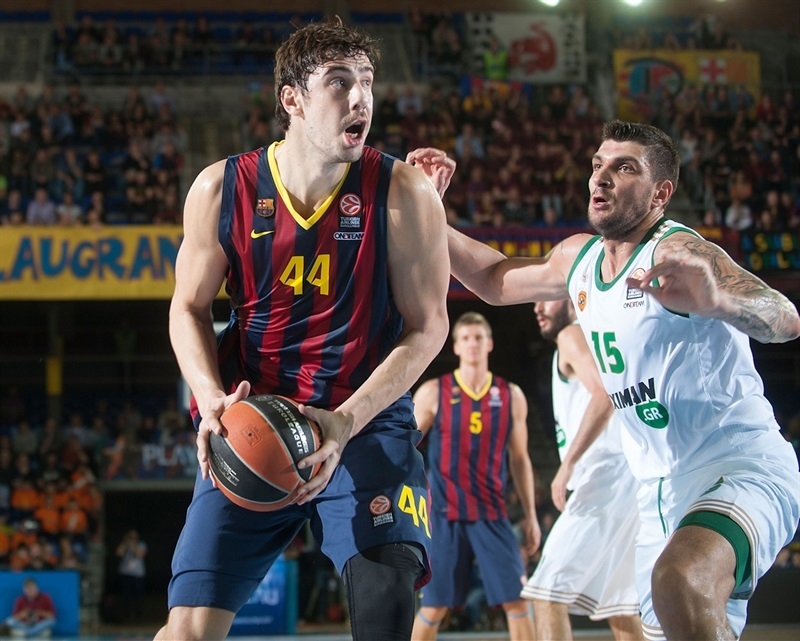 After Ante Tomic shined with a great move in the low post, Esteban Batista scored down low. A 'bomba' by Juan Carlos Navarro gave Barcelona a 6-4 lead. Tomic scored again and matched Batista's big basket with another layup. Diamantidis hit a mid-range jumper and a three-point play by Batista gave Panathinaikos its first lead, 10-11. Navarro fed Tomic for an easy basket, but an unstoppable Batista split free throws and a jumper by A.J. Slaughter put the Greens back ahead, 12-14. 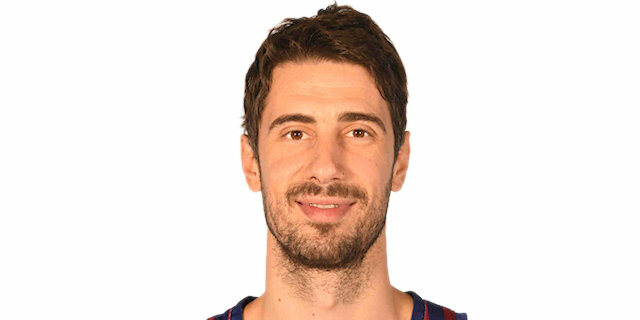 Tomic scored in the low post and free throws by Tomas Satoransky restored a 16-14 Barcelona edge. 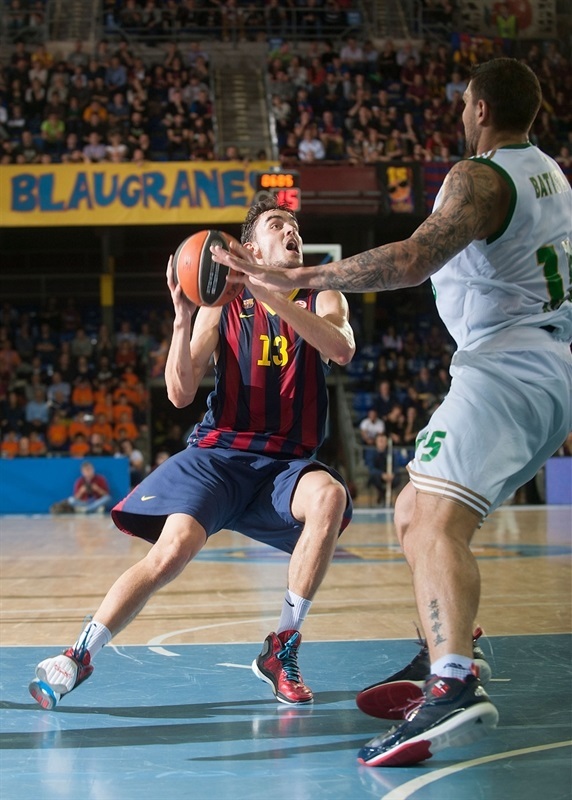 After Antonis Fotsis and Diamantidis made foul shots, Satoransky shined with a reverse layup. Janis Blums tied the game at 18-18 after 10 minutes. Brad Oleson ignited the crowd with an off-balance three-pointer - and the free throw that came with it. James Gist scored around the basket but Maciej Lampe answered with a mid-range jumper, good for a 24-20 Barcelona lead. Loukas Mavrokefalidis shined with a three-point play, Satoransky answered with a tip-in and an incredible off-balance layup by Gist kept the Greens within 26-25. Lampe kept pacing Barcelona with a put-back basket and a three-pointer but Gist singlehandedly kept Panathinaikos close, 31-30. Slaughter split free throws and Oleson struck from downtown for a 34-31 Barcelona edge. Gist stayed on fire with a tip-in but 7 unanswered points by Justin Doellman gave the hosts a 41-33 lead. Tomic capped a 9-0 run with a tip-in, Batista scored around the basket and a free throw by Alex Abrines made it a nine-point game, 44-35. Fotsis and Navarro traded triples to fix the halftime score at 47-38. Vladimir Jankovic hit a jump hook immediately after the break, which Doellman matched with a layup. Panathinaikos kept powering the offensive boards, but shots did not fall in. Back-to-back three-pointers by Marcelinho Huertas boosted Barcelona's lead to 55-42. Diamantidis took over with a wild driving layup and Slaughter added a fast break basket for a 55-46 advantage. Tomic scored down low, but Pappas made free throws. 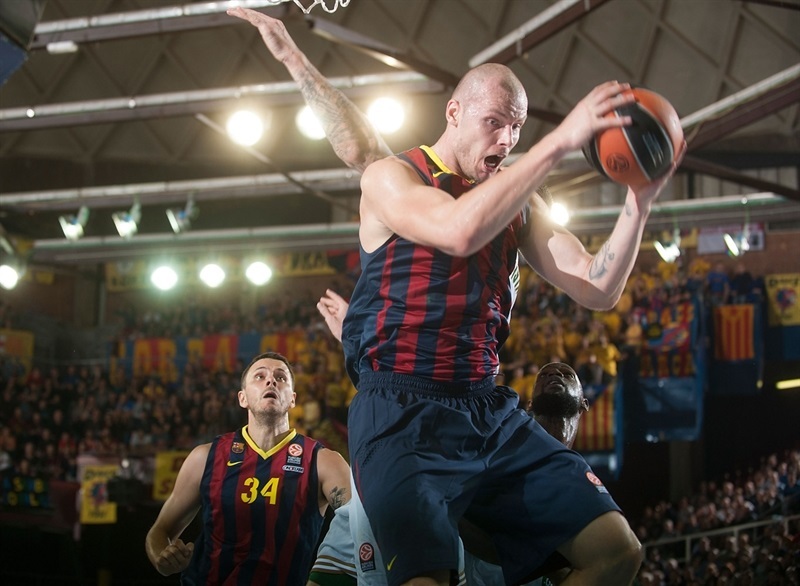 A running hook by Lampe restored a double-digit Barcelona margin, 59-48. Pappas scored in penetration and Mavrokefalidis hit a shot, but Oleson stepped up with a jumper, which he followed with a technical free throw for a 62-52 Barcelona lead. Eleftherios Bochoridis scored off a steal, but Satoransky found Navarro for a three-pointer. A very active Mavrokefalidis scored again to keep the Greens within 64-56. 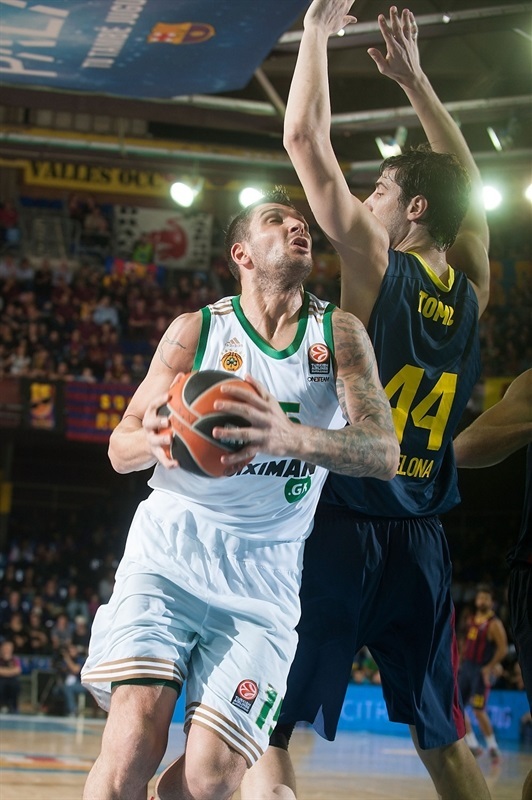 Both teams were scoreless for almost two minutes until Navarro struck from way downtown for a 67-56 Barcelona lead. Panathinaikos could not find the way to the basket until Diamantidis nailed his trademark step-back jumper. Jankovic split free throws to make it a 7-point game with over six minutes left. 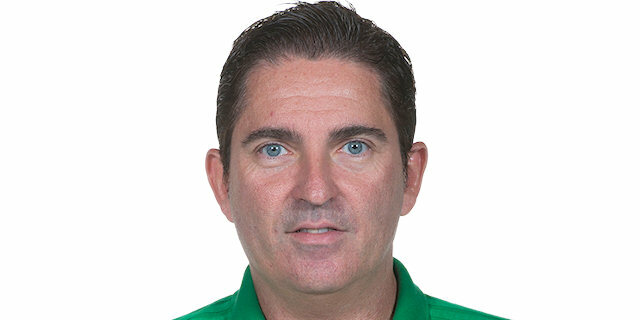 Abrines was ejected after his second technical foul and Pappas brought the Greens even closer, 67-62. 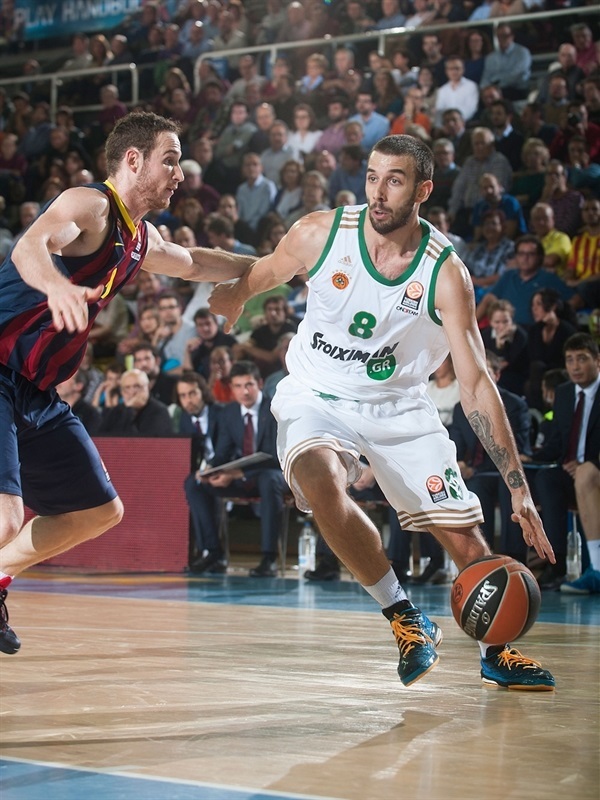 Huertas took over with a running jumper, as Panathinaikos kept missing shots from downtown. A three-pointer by Lampe gave the hosts a 72-62 margin with three minutes left. Blums answered from downtown - Panathinaikos's second triple in 18 attempts - but free throws by Navarro and a layup by Tomic sealed the outcome, 76-65. 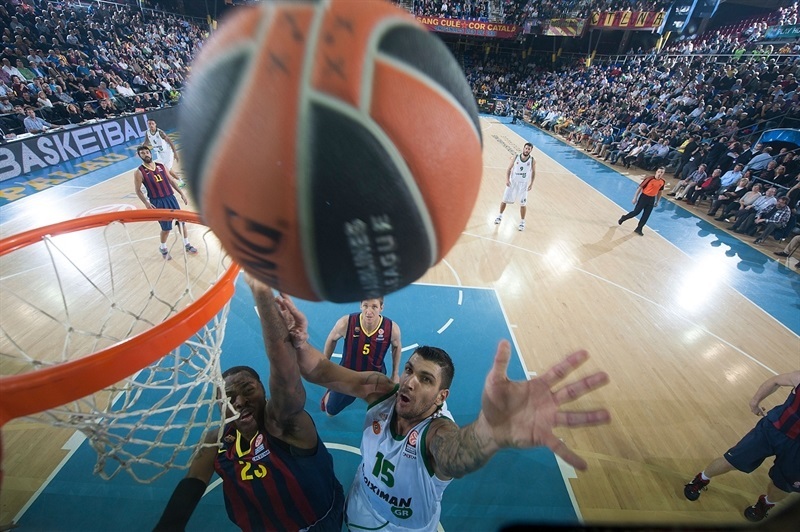 Panathinaikos did not stop fighting, but Barcelona kept full control of the game until the final buzzer. "I am very happy, this is a special win. We were looking for a game like this in the first half to keep our options in the second half. We had three consecutive turnovers in the third quarter but even with that, our good defense allowed us to win. I am happy with our 5-0 record, but also with the great support from our fans. We are close to reach the Top 18. We played very good defense in the first half, when Panathinaikos is always stronger. We planned to stop their three-point shooting because they hit 18 against Fenerbahce Ulker. We played good defense and they didn't shoot well. Our strategy happened to be the right one." "I think we lacked a bit of self-confidence. We should have believed we could win. Our three-point shooting percentage was really bad but even with that, not shooting well, we had options to win the game. Barcelona is a big team, one of the best in Europe along with Real Madrid, CSKA Moscow and Fenerbahce Ulker. You can tell that a lot of players have been playing together for long time. It is one of the favorites to be in the Final Four. It is always good to be back to Palau Blaugrana. My stay here was an excellent experience." "We are happy - we are undefeated in the league and had one loss in the Spanish League. We are in the good way. 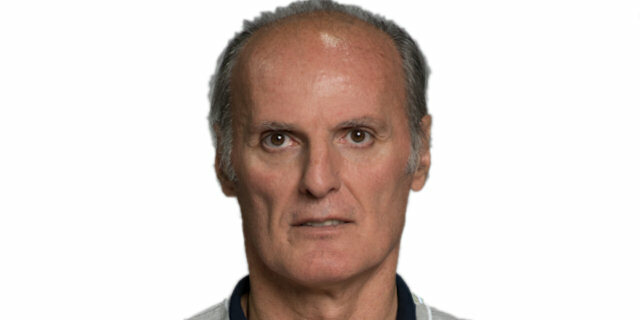 We played a good game against a tough opponent, as every team coached by Dusko Ivanovic. We knew this game would be a war. They grabbed a lot of offensive rebounds in the first half. We have to improve that if we want to challenge for everything." "Truth to be told, we know what to expect against Panathinaikos. They always play tough and this is the way we have to play against them. We struggled against Batista's offensive rebounds but in the end, I am tired but very happy because this is a very important win for us. We had a lot of turnovers in the second quarter. We have to limit those turnovers if we want to win big titles. It is a difficult group but until now, we have done very well." "We didn't play well enough to beat Barcelona in its home court. 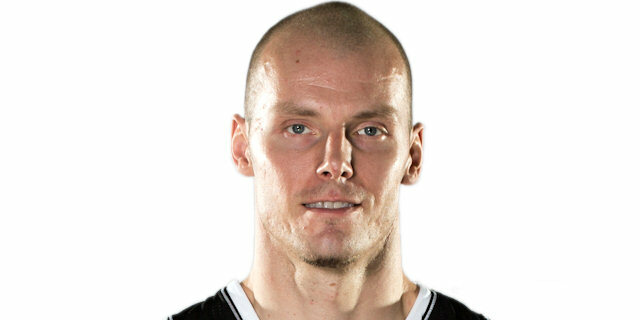 Basicly, our problem was our poor outside shooting percentage, which was a strong weapon for us until now. Barcelona has played really good defense."